In a summer packed with larger-than-life characters like the Terminator, the Hulk, and Neo, few expected that the season’s box office champ would star a tiny fish. However, that’s exactly what happened, as Pixar’s quiet little Finding Nemo emerged as the season’s highest-grossing movie. At the film’s start, we meet two clownfish: Marlin (Albert Brooks) and Coral (Elizabeth Perkins). They have babies on the way, but a barracuda attacks and apparently kills Coral and all the eggs except one. After Coral’s wish, Marlin names the sole survivor Nemo, and the movie soon jumps ahead to Nemo’s (Alexander Gould) first day of school. Nemo’s excited, but the overprotective Marlin frets about his son’s well being. When Nemo meets some new classmates, they show him the “drop-off”, the point at which their domain goes into the open ocean. They dare each other to enter that zone. When Marlin’s overweening nature embarrasses Nemo, he swims out there, where a human diver bags and takes away the little guy. In the meantime, we discover that a Sydney, Australia dentist (Bill Hunter) bagged Nemo and placed our little friend in his office’s aquarium. The dentist plans to give Nemo to his niece Darla (LuLu Ebeling), which sounds fine except the bratty little girl’s death on fish. Nemo meets the gang in the aquarium, a group led by Gill (Willem Dafoe), another fish who originally came from the sea. Gill comes up with a plan to get Nemo and all the others out of the aquarium and into the ocean. Ever since I saw Toy Story back in 1995, I’ve been in the bag for Pixar’s feature films. Nemo represents their fifth full-length effort, and the studio has yet to misfire. By their standards, the $162 million of 1998’s A Bug’s Life feels pretty weak; along with the $191 million of Toy Story, it’s the only flick to make less than $200 million. Both 1999’s Toy Story 2 and 2001’s Monsters, Inc. flew past the $200 million mark and were tremendous successes. Nemo beat them all, however. As I write this, we still have more than two months left in 2003, so I don’t know how the year will end. To date, Nemo remains first in the box office charts by a large margin. With a take of $338 million, it stands ahead of the current second-place flick - Pirates of the Caribbean, another Disney release – by $38 million dollars. The final installment in the Lord of the Rings trilogy may give Nemo a run for its money, but it just might retain the box office crown. In any case, it seems that everybody loves Nemo, and we’ve already established that I’m a big fan of Pixar’s flicks. So why do I remain moderately ambivalent about the film? When I saw Nemo theatrically and left unenthused, I thought it might be because of anticipation. Obviously, I go into Pixar movies with a high level of expectations, and whenever that happens, it becomes hard to objectively judge the product on first glance. Many of my favorite films – like Aliens or This Is Spinal Tap - didn’t do much for my during my initial viewings because I’d heard such incredibly positive comments about them. Only when I gave the pictures a second chance could I better enjoy their pleasures. Did I like Nemo better on DVD than I did theatrically? Probably, if just by a small margin. However, it didn’t leap out at me in a major way. The opinions I maintained when I left the theater last May remained about the same as what I thought when I turned off the DVD. I encountered a similar concern with Monsters, Inc. With that flick, I went in with high expectations and didn’t feel all that excited about the film when I first saw it. The subsequent screening on DVD did little to improve my opinion of it. To be sure, the computer animation has improved radically in the years since Toy Story. The good folks at Pixar bring the ocean setting to life in a lovely way. They make it just realistic enough to satisfy the viewer, but they add some cartooniness to ensure we remember we’re in a fantasy setting. The movie looks great at all times, and the characters display convincing emotions and attitudes to become believable – or as believable as talking fish can be. Nemo even takes a daring turn or two. The opening of the film seems surprisingly somber and depressing. Off the top of my head, I can’t think of another Disney flick with such an immediate dose of tragedy. Sure, Bambi’s mom gets shot, but that doesn’t happen until mid-film, whereas Marlin’s family is decimated before the butter on your popcorn congeals. It’s a risky way to begin the movie, but the filmmakers make it succeed. The lack of obvious flaws creates my biggest issue when I try to relate my feelings about Nemo. I can’t hang my hat on this problem or that one, since the movie fails to display any concrete concerns. All I can figure is that it doesn’t feature the “Lasseter Spark”. Pixar founder – and Nemo executive producer – John Lasseter directed the studio’s first three features, but he handed off the reins to Pete Docter for Monsters Inc. and Andrew Stanton for Nemo. Both have long histories of their own with Pixar, and both prove very able in their roles. However, the results simply lack a certain liveliness that occurred in the Lasseter directed flicks. Both Docter and Stanton certainly are passionate and skilled filmmakers, but they don’t seem to be able to take their movies to the heights that Lasseter wrings out of his tales. Maybe I’m wrong and maybe his absence as director has nothing to with my lesser enthusiasm for the two flicks he didn’t direct. Perhaps I’ll figure out how much his presence as director means to these movies in a couple of years; according to IMDB, he’ll finally return to that role for a 2005 effort called Cars. As it stands, I continue to enjoy Finding Nemo and I think it offers a consistently sweet and endearing experience. The movie has a lot of positives and few – if any – obvious negatives. It simply lacks a certain spark that would take it to a level of greatness. 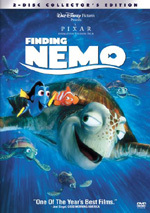 Finding Nemo appears in both an aspect ratio of approximately 1.85:1 and in a fullscreen version on these single-sided, double-layered DVDs; the widescreen image has been enhanced for 16X9 televisions. Only the letterboxed picture was reviewed for this article. To date, every Pixar DVD has looked great, and Nemo followed suit with another excellent image. Sharpness seemed immaculate. At all times, the movie remained terrifically crisp and detailed, and not a single instance of softness or fuzziness occurred. The image stayed detailed and distinct from start to finish. No signs of jagged edges, moiré effects or edge enhancement appeared, and the movie also was totally free of any source flaws. As with the other Pixar flicks, they created the DVD transfer straight from the original computer files; they used no print at all. This ensured a presentation completely devoid of any defects. The ocean setting of Nemo offered a nicely bright and varied palette, and the DVD reproduced the colors wonderfully. From the many hues of sea critters to the vegetation to the other natural elements, the movie demonstrated a terrific variety of hues, all of which seemed terrifically vibrant and lively. Black levels also looked deep and rich, while shadow detail was appropriately heavy but not overly dense. If any problems, I couldn’t find them, as Nemo presented a simply outstanding picture. While not quite as strong as the picture, the Dolby Digital EX 5.1 soundtrack of Finding Nemo nonetheless lived up to expectations. The movie featured a surprising amount of directional dialogue that helped contribute to the feeling of realism. The ocean setting offered a lot of opportunities for a nice sense of atmosphere, and the movie delivered them well. Quieter scenes presented good ambience, and the louder ones kicked the action into gear nicely. To be sure, the movie featured a lot of chances for that. From the explosion of the mines to the fish attacks to the rush of the current, the track featured a great deal of effects that maintained a great feeling of place and setting. The elements seemed well placed and integrated cleanly. The surrounds added a lot of unique audio and helped accentuate the sense of place. The rear speakers behaved as pretty active partners and were quite effective. Audio quality seemed solid. Speech was distinct and natural, and I noticed no signs of edginess or problems with intelligibility. Music was bright and dynamic, as the score sounded concise and full. Effects also sounded tight and accurate. The various elements were well defined and detailed, and they presented fairly good low-end response. Bass seemed a little overcooked at times and wasn’t quite as firm as I might like, but those elements mostly sounded fine. Overall, this was a fine soundtrack. As one might expect, this two-disc set of Finding Nemo packs in good number of extras, though it doesn’t match up with Pixar’s more extensive sets. On DVD One, we start with an Introduction from director Andrew Stanton and co-director Lee Unkrich. In this 74-second piece, the pair give us a basic introduction to the package. It’s worth a look if for no reason other than to check out some goofiness from Pixar biggie John Lasseter in the background. The main supplement on DVD is the visual commentary. This combines a traditional audio commentary with some automatic branching features that include additional material. For the chat-only portions, we hear from director Stanton, co-director Unkrich, and co-writer Bob Peterson. The track provided a lot of great information and it neatly melded technical and creative elements. We learned about the film’s origins and path through production as well as many aspects of the character and story development. We heard about changes made to both and also found out about work with the actors. In addition, we got notes about the many technical challenges and other design elements. The three demonstrated a nice chemistry and provided some very funny moments during this lively, educational and enjoyable commentary. As for the visual components, here’s how those functioned. After a 53-second introduction from Stanton, Unkrich, and Peterson, you’ll find that the DVD “branches” off a whopping 47 times during the film. When that occurs, we find clips that last between seven seconds and two minutes, 47 seconds; all told, the visual elements last a total of 35 minutes and 44 seconds. The branching videos cover a variety of topics. We get audio outtakes from the actors, deleted scenes and unused concepts, production art, excerpts of Stanton’s story pitch to merchandisers, a quick listen to a music and effects only track, a scene progression reel, trivia bits like background elements you might miss, and shots of recording sessions. In addition, many segments look at the technical aspects of the animation and those elements. We see behind the scenes pieces along with interview clips. The latter feature Stanton, Unkrich, studio tools R&D lead Andy Witkin, supervising animator Dylan Brown, reef unit lighting lead Kim White, CG supervisor/reef unit David Eisenmann, art director/shading Robin Cooper, directors of photography Sharon Calahan and Jeremy Lasky, supervising technical director Oren Jacob, Monsters Inc. producer Darla Anderson, crowds lead Justin Ritter, studio tools developer John Anderson, CG artist Martin Nguyen, and executive producer John Lasseter. Despite the brevity of the branching segments, they usually offer good material. They definitely provide a nice variety of elements, and we get a lot of information in these compact pieces. A little more depth per bit might have been nice – some of them fly by awfully quickly – but overall, we find a great deal of useful material in this visual commentary. I must admit I’m not wild about the DVD’s implementation of the program, mostly because of the way it affects the audio commentary. As far as I can tell, there’s no way to listen to that track without the video branching activated. I tried to flip audio channels to no avail. This meant that the commentary constantly got interrupted with video pieces, and that made it more disjointed than I’d like. The two flow together well, but I like to tape the commentaries and listen to them elsewhere, which became awkward and difficult with this format. As for the video snippets, those are much easier to access. You don’t have to watch the whole movie to get to them. A very helpful “index” appears, so you can quickly and simply get to the bits you want to see. Next on DVD One, we find a documentary called Making Nemo. 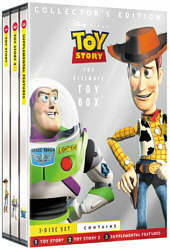 This 25-minute and 35-second program includes short clips from the movie when appropriate, many behind the scenes images, and interview clips with Stanton, Lasseter, Unkrich, Peterson, Jacob, Calahan, Cooper, Brown, art director/characters Ricky Nierva, professor of physiology Dr. Adam Summers, production designer Ralph Eggleston, story supervisor Ronnie del Carmen, editor David Salter, sculptor Jerome Ranft, producer Graham Walters, production supervisor Marcia Jones, animator Karen Kiser, directing animator Mark Walsh. They cover a mix of relevant topics. We learn about the research behind the film, realism vs. make-believe in the settings, underwater tests, the evolution of the story and script, use of storyreels, use of colors, the depiction of the fish, building the characters, dealing with movement, breaking the tension in the office, animating the characters, and other technical issues. “Making” moves somewhat too quickly and never feels like a terribly comprehensive examination of the film. However, it touches on many interesting topics and benefits from the liberal use of shots from the production. We get some great material from the studio and learn many useful points, so “Making” feels like a success overall. Inside the Design Galleries domain we find four subsections. Each of these includes either filmed images or stillframes. “Art Review” runs eight minutes, 33 seconds, and presents many design and conceptual drawings from the production. It can be viewed with or without commentary from Ralph Eggleston, Ricky Nierva, and Robin Cooper; they give us a nice look at the material and their work. “Characters” presents modeling rotations and conceptual sketches for 23 roles; these run a total of six minutes all combined. “Environments” gives us three sections of stillframes: “Reef” (11 pictures), “Ocean” (11), and “Harbor” (27). Finally, “Color Script” presents more than 300 made by production designer Ralph Eggleston. These come as a running, filmed piece, but you can skip from image to image with the chapter search on your remote. In a cute and unusual move, anytime you see a little fish icon on a screen, click it and you’ll watch a Virtual Aquarium. This varies dependent on the screen background when you select it, so you’ll get different aquariums. If you’re not patient enough to deal with them that way, an option displays all seven different aquariums and lets you choose from them. In addition, some of the menus also include some specially recorded banter from Albert Brooks, Ellen Degeneres and others in character. They provide some funny remarks that add to the presentation. Lastly, some small Easter eggs appear throughout the menus. Search for these and you’ll hear some additional funny messages from movie characters. When we head to DVD Two, we get the fullscreen rendition of the film plus additional extras. The disc opens with another introduction from Stanton and Unkrich. In this 63-second clip, they tell us what we’ll find on the platter. After this we move to Exploring the Reef, an attempt at a documentary with Jean-Michel Cousteau. However, our friends from Nemo soon interrupt the proceedings and slowly aggravate the host. The seven-minute piece is moderately educational and fairly entertaining. For a classic Pixar short, we head to Knick Knack, a clip from 1989. Computer animation has certainly become radically more sophisticated over the last 14 years, but this three-minute and 35-second cartoon remains fairly amusing. Apparently Disney DVDs can’t exist without games, so here we get Fisharades. This one has the silverfish gradually assemble critters, and you have to select their choice from four options. It’s moderately challenging and fairly fun. Another Disney DVD staple, Storytime presents a read-along story. Here we get a tale called “Nemo Goes to School”. The younger viewers will probably like this piece. “Behind the Scenes” encompasses three different areas. Character Interviews provides a two-minute and 28-second piece in which a smarmy dude chats with Dory, Marlin and Nemo. It’s cute but not particularly entertaining. Studio Tour runs five minutes and 24 seconds as young voice actor Alexander Gould takes a look behind the scenes. It gives us a very quick examination of the filmmaking process and plays it mostly for laughs, which makes the “Tour” moderately amusing. The final segment of “Behind the Scenes”, Publicity includes a number of elements. We get the teaser trailer for Nemo as well as three full trailers. In addition, we find three Fishy Fact promos for Bruce, Crush, and Nigel. Lastly, Print Gallery shows 18 frames worth of posters, billboards, lobby cards and bus shelters. Another Virtual Aquarium option lets you directly select DVD Two’s choices. A few more Easter eggs appear on DVD Two. I found a short gag with Dory and an ad for the AquaScum 2003. There may be others I didn’t locate. As the DVD starts, we encounter a mix of ads. We find trailers for the upcoming Pixar theatrical effort The Incredibles plus Home On the Range, , The Lion King 1 1/2, and The Santa Clause 2. In addition, you’ll see these clips in the DVD’s Sneak Peeks domain along with promos for Spy Kids 3D and Disney’s upcoming special edition DVDs for Pocahontas, Alice In Wonderland and Lilo & Stitch. In a nice – and unexpected – touch, most of this set’s video extras present English subtitles. Paramount and DreamWorks do this regularly, but subtitles appear much more infrequently on Disney releases. As such, they’re a pleasant surprise here. Overall, Finding Nemo provides a gentle and amusing movie. It doesn’t rank among Pixar’s best efforts, but it seems consistently likeable and enjoyable, and based on its enormous box office success, it clearly appeals to a wide audience. The DVD presents excellent visuals along with very good audio and a fairly nice set of supplements. The latter elements don’t match up with the stronger Disney special edition DVDs, but they remain well above average for the format as a whole. A warm and entertaining fable, Finding Nemo earns my recommendation.